Drug Kaletra – a combination product that contains in its composition lopinavir and ritonavir. 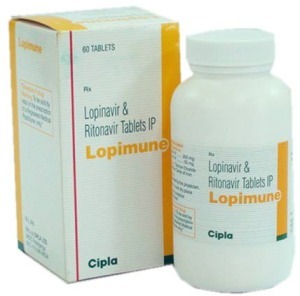 Lopinavir is an inhibitor of HIV-1 and HIV-2 protease of human immunodeficiency virus (HIV) and provides antiviral activity Kaletra. Inhibition of HIV protease prevents the synthesis of viral proteins, that leads to formation of immature and unable to infection by the virus. Ritonavir is an inhibitor of aspartyl proteases of HIV-1 and HIV-2, for oral administration, the active peptide mimetic. Inhibition of HIV protease prevents cleavage of the group-specific polymerase antigen (gag-pol) polyprotein, which also leads to the formation of immature and unable to infection by the virus. Ritonavir has selective affinity for the HIV protease and exhibits little activity against human aspartyl proteases. It inhibits CYP3A enzyme-mediated metabolism of lopinavir in the liver, resulting in increased concentrations of lopinavir plasma.